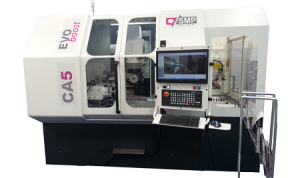 The SMP CA5 EVO Boost 5-axis Tool Grinding and Resharpening Centre equipped with a 720 mm table, large selection of accessories, powerful electro-spindle and Easy Grind “all in one” software, is a great machine covering all the needs of small to medium size cutting tools. Mounted with a six position grinding wheel magazine as standard (18 positions optional) the CA5 from French manufacturer SMP TECHNIK is able to unload / load a new wheel in less than five seconds, providing an installation of six grinding wheels of 150 mm diameter. The rigid nozzle tool cooling system consists of a standard cooling system with two nozzles, with a possible extension of an additional cylinder controlled cooling system. The HSK40, HSK50 or HSK 10 to 25 Kw high frequency electro spindles are speed adjustable up to 12,000 rpm and include a self-cooling system The 500mm long table provides enough space to install all necessary accessories such as tailstock, fixed steady and diamond grinding system. The SA50 workpiece holder, combined with a direct drive motor with encoders, developing a high speed of 650 rt/mn, allows all resharpening operations. Renishaw tool probing enables the tool detecting and measuring system to ensure the best resharpening and the best grinding, providing regularity in tool shapes. Due to the heavy mineral casting bed underneath, the machine is vibration proof, offering better rigidity and providing a much better tool surface and finish. EasyGrind full option software is included as standard. This allows programming of all types of cutting tools, from standard tools, complex tools, special applications, 5-axis rectification, drills, radius cutters, taps, mills and reamers to medical tools, form milling cutters and drive tools. 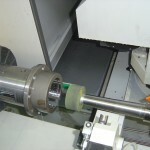 Additional options include: a Renishaw wheel sensor can be mounted inside the machine, allowing the follow up and offset of wheel wear without human intervention; manual tailstock to enable horizontal and vertical adjustment to support long tools during the resharpening operation; a CNC control steady rest that behaves like a 6th axis, controlled by the CN, necessary for steadying very long tools to maintain the quality of the operation. 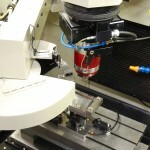 A robot charger can act as a 6th axis to perform automatic tasks such as changing tools and grinding wheels. The standard version accommodates 200 tool rack/batch, of 16 mm diameter or 104 tools of 32 mm diameter and tool length up to 250 mm. The Moore Tool Company manufactures and remanufactures a complete line of jig grinders and has a high-end, ultra-precision manufacturing business certified to ISO 9001:2008 and AS9100C. The company is ITAR registered. Moore’s tool business builds fully automated and highly productive CNC Continuous Path jig grinders. The company offers a complete line of machine accessories, including the ProGrind system which includes electric grinding spindles, flood coolant enclosures, as well as advanced sensor-based systems such as Moore Autogrind and the patented Moore Autosize®. Moore’s precision manufacturing business specialises in aerospace and defence related machining including 5-axis milling and ultra-precision jig grinding. In addition, Moore designs and manufactures tooling for the food packaging, metal stamping and plastics forming industries. Founded in 1924 in Bridgeport, Connecticut, USA, the Moore Tool Company has a long history of providing precision machine tools and measuring machines to the world’s most demanding customers, people who need to machine and measure parts to increasingly tighter tolerances. Tool has updated its sensor system by integrating the very latest in acoustic emission sensor technology. This is fully integrated with Moore AutoSize® and enables dynamic measurement of effective wheel diameter as well as automatic compensation of wheel edge to part edge. Department, Customers are discovering more and more innovative ways to cost- effectively utilise jig grinding in their most critical operations. In response to customer’s requests, Moorehasintroducedanumberofgrinding innovations, including the Moore ProGrind® platform to support both small and large scale production runs. These new features help empower manufacturers to realise even greater efficiency whilst still achieving sub-micron positioning and surface finishes. Moore ProGrind features a powerful electric grinding spindle and coolant system that provides dramatically improved stock removal rates, better surface finishes and longer tool life. With ProGrind, companies are grinding with greater confidence, both attended and unattended. The machines are completely CE-compliant and use state- of-the-art sensor technology, including remote listening and monitoring capability. Constant torque is maintained throughout the speed range of 10,000 to 60,000 rpm. Other time saving enhancements include a 20 position automatic tool changer for unattended operations. for the precise finishing of holes and contours. This allows unattended cycles and, in an ideal environment, repeatability to within 3-5 microns. Moore has also worked with Renishaw to implement the latest advances in Renishaw’s measuring system. The new OMP400 together with Moore’s custom macros high levels of measurement levels can be integrated into the grinding cycles. The company has also worked with Fanuc to develop the Fanuc 3Ii-a control into the highest performing CNC available for jig grinders today. 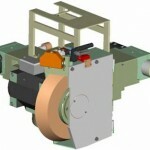 Moore Tool jig grinding machines are available in three models: CPZ, CPZ-E and CPWZ. To find out more, visit the Moore Tool stand at GrindTec. For the past 25 years FSG Tool & Die Ltd (based in Llantrisant, Wales) have been supplying sub-contract jig grinding capabilities to the manufacturing industry, this is a core part of FSG’s business. After substantial investment in other key areas, the decision was made to invest in new jig grinding technologies to continue to enhance the reputation the organisation has built for the quality and accuracy FSG bring to the surface, cylindrical and form grinding process. Advances within jig grinding machinery meant that this would now support the modern manufacturing systems employed by FSG. FSG were looking to refine their existing processes by seeking a solution that would enable them to operate on an unattended and continuous basis when needed. This would ultimately lead to an additional capacity capability. Heavy emphasis was placed on the need to maintain the supply of the highest quality of components. Compromise was not an option and would therefore allow FSG to develop existing client relationships and create new business opportunities. NL Machine Tool Consulting Ltd have been working directly with FSG for the past 3 years, assisting them with new investment and sub-contract projects. It was natural that Norman Loughton’s (Director of NL Machine Tool Consulting) expertise within the jig grinding industry would be of assistance during the evaluation and selection process. A lengthy fact finding process began where FSG reviewed all of the available manufacturers that could supply jig grinding machines that would potentially be the solution that they were looking for. Following a number of internal and external meetings, the decision was made to visit the Moore Tool Company, Inc. headquarters in Bridgeport, Connecticut USA to test the Moore 500 CPWZ Jig Grinding Machine, with Fanuc 31-A Control System. During the visit FSG received a factory tour and a chance to use the Moore 500 CPWZ, grinding FSG’s production parts. It was clear that the superior build quality and attention to detail, would lead to a machine that would exceed all expectations and greatly enhance FSG’s capabilities. Potential concerns on the support and maintenance cover from overseas based machine tool manufacturers were quickly resolved through the support, maintenance and warranty package set up with Konecranes Machine Tool Service (UK service partner to NL Machine Tool Consulting Ltd and Moore Tool). Konecranes engineers were put through an extensive training programme at the Moore Tool Company facility. This process gave FSG the confidence that the Moore 500 CPZW Jig Grinding Machine will be fully supported through a UK based company and will exceed the capabilities currently offered by most UK based machine tool manufacturers. The whole process from purchasing to servicing has been enhanced by the involvement of NL Machine Tool Consulting acting as the key link between Moore, System 3R, Konecranes and Camtek. The new Moore 500 CPWZ Jig Grinding Machine will not only allows FSG to boost existing capacity but also support the constant customer demand for more complex products. FSG has a global footprint in a number of key manufacturing sub sectors such as Medical, Packaging, Defence, and Automotive. “All of these sub sectors share the same characteristics of constant innovation. For any company in the supply chains, the ability to offer this type of service is a differentiator.” States Gareth Jenkins, Managing Director of FSG Tool & Die Ltd.
To ensure that the demands of clients and service levels are met, FSG purchased the Moore’s Enhanced Accuracy Package. The results of this build philosophy at Moore are quite staggering and will allow FSG Tool & Die Ltd to continue to innovate and stay at the forefront of technical excellence. In the newest DLM series, Stähli combines the latest engineering know-how with control and measurement technology, in combination with automation in various expansion stages. 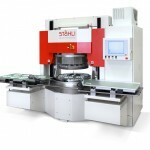 The flat honing machine DLM 805 from Stahli is available with up to 8 carriers! Latest process applications also allow the production of delicate components on the 2-wheel flat honing machine that require a single side operation. The DLM 805 is also offered as an 8-carrier version, this means a massive increase in productivity compared to the traditional version with 6 carriers. The batch processing results in the highest possible quality through process and thickness controlled production, at cycle times of less than 1.5 seconds per part. Compared to conventional production methods, up to 60% can be saved on production times. Through the use of modern machine technology, supported by diamond or CBN wheels, virtually all materials such as plastics, nonferrous-metals, steel, soft or hardened up to PCD or silicon nitride can be processed economically. During the last 4 years Cogsdill-Nuneaton Ltd has been investing in new technology CNC machinery. This was a strategic decision specifically for the company’s turning and milling requirements. Cogsdill, who provide engineered speciality tooling solutions for the worldwide machine tool industry, have seen an increase in customer demand and their product offering has become more bespoke. 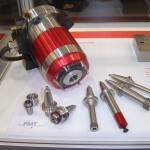 Naturally there has been a progressive move to CNC Grinding but their components were getting bigger and more complex. 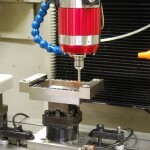 They needed to look for a solution that would give them full CNC universal grinding capability and accommodate the size of components that their customers were now demanding. Cogsdill sought the assistance and expertise of NL Machine Tool Consulting Ltd, a company that provides unique grinding, surface finishing, induction heating and washing solutions to UK industry, to identify a solution for their CNC grinding needs. 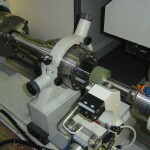 Norman Loughton, Director of NL Machine Tool Consulting Ltd, worked with Alan Quinney, Works Manager of Cogsdill-Nuneaton Ltd, to propose a CNC universal grinding machine that would meet the demands of their increased and specialised workload. The machine had to meet the strict criteria set by Cogsdill; the output of the product quality had to be consistently at a high level, cycle times had to be reduced, there needed to be greater control over the grinding process and certainly future proof their capability and investment. Having understood this criteria and the need to grind a wide variety of components in small batch quantities; typically 1 >-5, ground both externally and internally with a diameter range of 5mm – 350mm and a length range of 50mm – 650mm, Norman Loughton recommended the IMT Tacchella Elektra Plus 1523 UA. “From an operational standpoint, a key consideration when transitioning to a CNC universal grinding machine is the ease of use, programming and overall set-up. The Tacchella Elektra Plus 1523 UA certainly allows for this and maintains the highest possible standards of output” states Norman Loughton. Keith Johnson Managing Director of Cogsdill-Nuneaton Ltd and Alan Quinney visited the Tacchella facilities in Cassine, Italy to establish at first-hand the benefits and advantage the Elektra Plus 1523 UA would bring to their business. 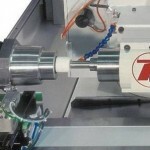 The IMT Tacchella Elektra Plus high precision universal grinding machine. After off-loading and positioning the machine, the Tacchella engineer arrived to commission and then provide operator training. This was all completed in a one working week period, after this time Cogsdill were in a position to continue to operate and improve their own understanding of the machine whilst simultaneously producing components. The machine has performed well, Cogsdill have completed a large number and range of jobs using both the external and internal functions of the machine. They have also undertaken a number of grinding operations using face plates 3 Jaw and magnetic chucks for work holding as well as grinding between centres. It is accurate to report that Cogsdill now have greater control over their grinding process than previously experienced and the machine has meet all their expectations to date. The purchase, installation, training and on-going support have more than met Cogsdill’s expectations, a real testament to not only Norman Loughton’s ability to understand the customer’s concept but also Tacchella’s ability to manufacture and deliver a grinding machine that now allows Cogsdill to meet their customer demands. Wanted: Your High Precision Parts! The new Elektra Universal Grinding Machine by IMT Tacchella, with OD grinding wheels diameter 508 mm and maximum width 100 mm, has been developed with new CNC controls and new wheel head configurations. The Elektra covers grinding lengths of 600, 1200 and 1700 mm with center heights of 180, 230 and 260 mm and is equipped with a torque motor B-Axis for the automatic swiveling of the wheel head, offered in five different executions, freely programmable through the CN control FANUC 32i or SIEMENS 840D sl. The unit for ID grinding can be specified with tools up to 120 mm diameter, and with three models of electro spindles is capable to cover a tool rotational range from 4000 to 60000 rpm. The brand-new work head, driven by a integrated torque motor (C-axis), and the new hydraulic tailstock enable the Elektra to grind round, non-round and polygonal work pieces weighing up to 250 Kg between centers. The cutting edge TACCHELLA Elektra UA universal allows grinding of complex, high precision work pieces with excellent results. Continuous search for reduction of production costs, increase quality and cleaner production processes so that cleaning can be optimized are targets and in the focus of all production managers. Stähli starts with the latest generation of 2-Wheel Flat Honing Machines in new dimensions! Increase your productivity by more than 30% and shorten your return on investment through reduced capital commitment periods. The latest generation Stähli DLM 705. Latest process applications permit the production of delicate components on the 2-Wheel Flat Honing Machine, such as those that require single side operations. The batch-processing yields the highest possible quality through process-driven manufacturing and realises production times of less than 1.5 seconds per part. Savings in production time up to 60% are possible compared to conventional manufacturing methods. Due to innovative engineering technology supported by modern diamond or CBN working wheels, almost all materials, such as: plastics, nonferrous metals, steel in soft or hardened execution up to PCD or silicon nitride, can be machined inexpensively. Whether it is consulting, sub-contract work, remote or local services, Stähli is your partner. Stähli’s products stand out and are noted for excellent performance and highest availability. The latest generation Stähli FLM 505.
m as well as loading and unloading tables are provided in the second generation. More and more single-lapping processes are converted by Stähli from the loose grain to the “clean lapping” process with diamond or CBN wheels. 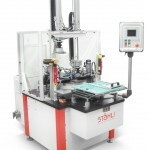 Whether it’s our 1- or 2-Wheel Flat Honing Machines, Stähli helps you in the optimal choice of partial or full automation as well as in the integration into manufacturing lines or connections to deburring systems. Launched at the recent EMO – Hannover the MORARA MT Multimatic is the new combined grinder from IMT MORARA for simultaneous bore, end-faces and external grinding, ideal for large production runs. In its brand new version, the machine is available in three different sizes: 250, 500 & 900 mm, – maximum rotating work-piece diameter. The machine bed is a monolithic structure in stabilized cast-iron, designed using 3D solid parametric modeling techniques and FEM analysis. Wheel carriages slide on hardened, preloaded guide ways with rollers and the axis movement is actuated by brush less motors via very high precision ball screws. The internal grinding unit features two CNC controlled axes to perform several different processes: internal diameters and/or end-faces, plunge grinding with CNC-dressed wheels, etc. The solution is given by a cross-shaped carriage with a turret for two or more spindles, swiveling on a Torque motor with movement resolution of 0.0001°. As an option, the work head can be equipped with an automatic swiveling system driven by a Torque motor, to grind complex profiles by axis interpolation. The external grinding unit features two CNC controlled working axes at an angle to each other and hosts a grinding wheel with diameter 610 mm x 70 mm wide with a peripheral speed of 50 m/s. 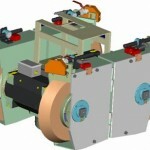 The internal wheel carriage carries a turret where it is possible to place up to two high frequency spindles. The control is a Siemens continuous-path type 840D. The new software is patented by IMT and was developed with the collaboration of all the brands within the group. The main aim of this development was to significantly reduce retooling times. The grinding machines of all the brands belonging to the IMT Group feature innovative technologies, modular structures which are expandable depending on the technical issue and, like never before, are presented as a unique product. The result of the synergies among the best Italian builders of grinding machines, today united together. The latest generation of MOORE Jig Grinding Machines provides many benefits and advantages to its users. With over 85 years of leadership in machine tool design and manufacture, US company Moore Tool – continues to evolve its line of four- and five-axis, CNC-controlled jig grinders. Integrating new enhancements with proven continuous path contouring capabilities, Moore Jig Grinders enable customers to more effectively grind complex two- and three-dimensional surfaces. With many recent advances in software and hardware, jig grinding continues to play a critical role in a wide range of small and large scale production applications, where consistency and the highest levels of accuracy and surface finish are required. From mold making to complex part manufacturing, today’s jig grinders deliver the highest degree of accuracy and repeatability required to successfully compete in today’s marketplace. 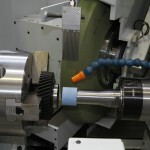 When effectively integrated into other machining operations including EDM and high-speed hard milling – utilizing manual or automated part palletizing system solutions – the enhanced capabilities of today’s jig grinders can create new opportunities with existing customers and open doors to completely new markets. Taking advantage of these developments, Moore Tool, a leader in building ultra-precision jig grinding equipment, is continuously enhancing the productivity of its jig grinder product line — making it more user friendly and relevant in today’s tool room and higher-volume production environments. 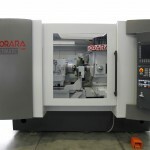 While building one of the world’s most accurate grinding machines has been and continues to be the foundation of Moore’s long-term success, a cornerstone of their strategy is to help define customer-specific processes and to help customers fully utilize all the advances in technology in order to create better parts — faster and at a lower cost. Through collaboration with Moore’s experienced Applications Department, customer’s are finding more and more innovative ways to, cost-effectively, utilize jig grinding in their most critical operations. In today’s competitive markets, manufactures must achieve greater and greater levels of productivity to remain cost effective in today’s global market place. In response to our customer’s requests, Moore has introduced a number of grinding enhancements, including the Moore ProGrind platform, to support their precision applications – from both small- and large-scale production runs. These new features help empower manufacturers to realize even greater efficiencies, while still achieving sub-micron positioning and surface finishes. With Moore ProGrind, users reap the time and tool-cost saving benefits that the latest grinding wheel advancements and wet grinding provide. Moore ProGrind features a powerful electric grinding spindle and coolant system for dramatically improved stock removal rates, better surface finishes and longer tool life. Along with the proven grinding spindle and coolant system, companies are grinding with greater confidence, both attended and unattended. These machines are completely CE-compliant, use state-of-the-art sensor technology including remote listening and monitoring capability. Companies are also benefitting from other time saving enhancements such as the 20 position automatic tool changer for unattended operations. With today’s electric grinding spindle technology, constant torque is maintained throughout the speed range of 10,000 to 60,000 rpm. Superior spindle taper and radial run-out, and greater repeatability tool to tool, helps ensure accuracy when using the 20 tool ATC. The hybrid ceramic ball bearings provide long life and less downtime. As part of the Moore ProGrind platform, the company has updated its sensor system by integrating the very latest in acoustic emission sensor technology. This technology is fully integrated with Moore Autosize and enables the dynamic measurement of effective wheel diameter and automatic compensation of wheel edge to part edge for precise size finishing of holes and contours. This important technology allows unattended cycles and, in an ideal environment, repeatability to within 3-5 microns. In addition, the sensor technology is fully integrated with Moore Autogrind an adaptive response system for automatically adjusting feed rates based upon stock encountered in tool path. The system minimizes time spent “grinding air” on work pieces with varied initial stock condition. Moore has also worked with Renishaw to implement the latest advances in Renishaw’s measuring system. Utilizing their latest technology – the new OMP400 – together with Moore custom macros, measurement uncertainty approaching extremely high levels can be integrated into the grinding cycle. 16X greater velocity feedback (16 million lines versus 1 million). As a manufacturer, staying ahead of the competition with the latest advances in equipment, software and processes is essential. In keeping up with these challenges, machine tool makers must continuously innovate to provide their manufacturing customers more accurate and more productive equipment. Today, Moore Tool jig grinders come standard with features that make the machine extremely productive and easy to operate. With these advances, the modern jig grinder continues to play an essential role in the most complex operations requiring superior accuracy, productivity and surface finish.